Firstly the performances in this film are all first rate, making many of the negative reviews unjustified. Patrick Fabian is outstanding as Cotton Marcus, an evangelical minister who’s made a sideline in providing an exorcism service. He readily admits he’s a fake, using no more than clever conjuring skills and the reliance of his gullible victims to get by. However, he is ready to come clean and, prompted by stories that many exorcisms have ended in deaths, suggests a documentary crew capture his very last exorcist duty. Whilst it delivers nothing new for the horror genre, I found The Last Exorcism surprisingly effective. If you’ve read any other reviews it will be no surprise to hear that the ending has met almost universal disapproval. Rather than a shock or twist conclusion, it’s just a surprise in that the last ten minutes or so of the film appear to be from something different altogether, not at all in keeping with what’s happened in the last hour or so. The final minutes also invite too much comparison with the wrapping up of The Blair Witch Project that make full appreciation of The Last Exorcism hard to justify. And viewers will no doubt come away with other borrowings from more original films. I counted Rosemary’s Baby and Race With the Devil amongst then. I’m still recommending this though, primarily for the superb Fabian and Bell. And, whilst it certainly isn’t a horror masterpiece, it is certainly an at times very creepy film. It’s Harry Potter time again. David Yates directs his third film in a row for the series, with the final part to come in 2011. The first part of Harry Potter and the Deathly Hallows peaks very early in its two hours plus running time. This is where Lord Voldemort (Ralph Fiennes) holds a get together for the Death Eaters. Seated around the table are Severus Snape, Bellatrix Lestrange, the Malfoy family and other assorted black clad baddies. You can almost smell their fear of the boss. I’ve been to some pretty grim team meetings in my time but nothing quite like this. It translates very clearly and very succinctly the terror of Lord Voldemort, even from his supporters, that runs through all of the novels. Tellingly, this very effective scene does not feature Daniel Radcliffe, Rupert Grint or Emily Watson. And I was unable to hide my general disappointment with the film as, more than any other of the Harry Potters, we are constantly teased by tiny cameos from great actors. 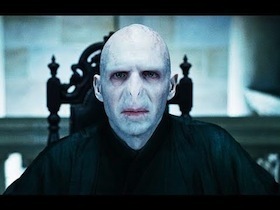 Fiennes, impressive as Voldemort, is hardly in it at all. Bill Nighy is magnificent as the Minister of Magic Rufus Scrimgeour but appears only briefly. Equally good is Rhys Ifans as Xenophilius Lovegood, but he’s wasted too with a very brief amount of screen time. Elsewhere other actors make far too fleeting appearances; John Hurt, Timothy Spall, Brendan Gleeson, David Thewlis etc. The true list is sadly much longer than this. The viewer is used to this in the series, however the film lacks any weighty presence at all from a distinguished British thesp; no Michael Gambon or Maggie Smith to hand out words of wisdom. And whilst Alan Rickman does feature a little we miss his trademark sneering at Harry. In his absence I caught myself sneering at him once or twice instead. But it might be best to reserve proper judgement on Harry Potter and the Deathly Hallows for when the second and final part is released. In setting the scene for the big finale, the seventh Harry Potter movie runs the risk of being uneventful and empty. But that’s what the book is like, fans may argue. True, but some fans may be expecting more. Some may even feel shortchanged by this half of a film. But we’ll reserve judgement for now. So what happens in this film – and, more to the point, if you haven’t read any of the books do you stand a hope in hell in actually following any of this? Well probably not. In the first of the films not to feature Hogwarts, our heroes appear strangely misplaced throughout The Deathly Hallows, awkwardly stolen from the usual sequence of term events that they’re used to. On the run from the Death Eaters, they spend much of their time hanging around in a forest literally twiddling their thumbs. Don’t fret Ron, I’m sure I heard Harry say, this will all be over by next July when the second part comes out and things really get going. Harry, Ron and Hermionie have too much time on their hands, pondering their fate in the open air. It’s beautifully filmed, and there is a wonderful sequence with Harry and Hermione dancing, but the younger viewers will find this instalment dull. And my younger viewer in tow informed me so. Although it’s unfair to say that the film is a damp squib, and there are some excellent set pieces that you would come to expect from a Harry Potter film. The scene where some unwelcome nasties gatecrash a wedding is very good, as is the sequence where Harry and his chums break into the Ministry of Magic disguised as adults which is one of the best episodes of the series. And the cartoon sequence, that explains just what the Deathly Hallows are all about, is a visual treat. It’s just that I expect more from the acting talent on hand, and the likes of Fiennes, Nighy and Evans were truly wasted. I also feel, and I’m really, really, sorry about this, that the whole franchise has dragged on for too long. And Lord V. really ought to do something about that nose. It isn’t that I’ve ignored films this year (the last post for 2010 Cinema was way back in May), it’s just that I’ve hardly found anything to rave about. Watching new films has recently become something of a chore, and I’m sadly resigned to regular disappointment. Things picked up spectacularly this week with a British film I’ve been dying to see for some time. The Disappearance of Alice Creed is written and directed by J. Blakeson and features only three actors, Gemma Arterton, Eddie Marsan and Martin Compston. This is an intense thriller, and although at times the acting jumps into the gear of melodrama it succeeds very well in delivering a series of twists, turns and incredibly gripping moments. It’s probably going to end up as my film of the year. So here it is. Only my fourth film review from 2010. The premise of the film is relatively straightforward, where two ex cons meticulously plan and execute the kidnapping of a millionaire’s daughter. We see them wordlessly choosing the tools for their scheme in the film’s opening as they purchase soundproofing from B&Q. Such a mundane activity with a particularly disturbing background. From here they put together a cell for their victim, and following the swift abduction the film appears to be settling into some rather unsettling territory when Creed is routinely stripped naked, gagged and bound by her captors. But Blakeson reveals a talent for debunking the viewers expectations; the film slips more comfortably into the interaction between the three leads. The older of the two men is Vic, and Marsan plays him as edgy and monosyllabic. His true relationship with the much younger Danny (Compston) is slowly unravelled throughout the film. Danny’s own mixed motives form a pivot for much of the drama, and never has the repeated flushing of a toilet provided so much tension on screen. Gemma Arterton as Alice has possibly the toughest role, having to convincingly portray fear and strength in equal measures, although she largely pulls it off. At times in feels like all three characters have been weaned in a world where the goings on in Reservoir Dogs and Shallow Grave are the norm, although I guess that suspension of disbelief is the key. And The Disappearance of Alice Creed held me for its full 90 minutes. Possibly I was slightly let down by Marsan, who appeared to deliver a somewhat lazy performance, but maybe I’ve grown to expect too much from this normally excellent actor. But it is still a far above average film. The ending in particular is superb, where Alice almost breaks the fourth wall by meeting the viewer’s eye. I don’t want to give too much away but all, perhaps, ends well. What defines a truly scary film? I’m not talking about great art in cinematic horror, which I think is different. Kubrick’s The Shining and Polanski’s Rosemary’s Baby are both artistic achievements, but I wouldn’t say that either scared me. I’ve watched them both countless times and can pick out many memorable aspects of them; Jack Nicholson’s masterful performance, Kubrick’s slow and deliberate direction, Polanski’s sheer cleverness in making a fantastic story believable. Both directors are also groundbreaking in using the modern setting for horror. But the films don’t really scare me; I love them just for the brilliant pieces of cinema that they are. Much hype surrounded the release of Paranormal Activity, a film made in 2007. It attracted instant comparison with The Blair Witch Project in its use of the hand held camera technique and there are other more subtle similarities. But it is unfair to say that Paranormal Activity is a Blair Witch copycat. It’s a much better film, more disturbing and one that demands more than one viewing in a way that its predecessor never did. And whilst The Blair Witch Project was a scary film, Paranormal Activity is far scarier. Katie and Micah are a fairly ordinary suburban couple. It’s the apparent ordinariness that makes this film so effective, particularly in the nondescript house where all of the film is set. Micah is intent on filming life at home. Some of this results in Blair style shaky handheld effects, whilst the rest of his footage comes from the hours of night vision photography taken in the bedroom. The double bed, the large white open door and the stop motion film as they toss and turn throughout the night. Why is he doing this? Katie believes she is being haunted, Micah believes he can solve the problem. 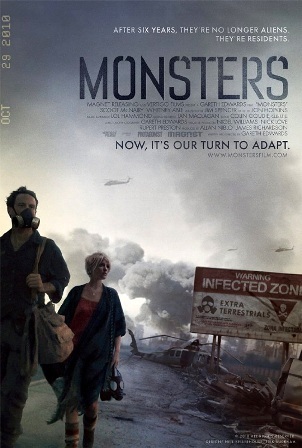 Director Oren Peli impresses in how the tension of this film very gradually cranks up. There’s one scene where a psychic, who appears at the beginning, is called again when things begin to turn bad. He senses the terrible atmosphere in the house and backs away, unable to help. It’s that sense of awful oppressive danger that comes across so well. Partly it’s to do with claustrophobia, the relatively tight setting of the film, but the build up is done so effectively. At first, the night footage reveals nothing more than noises coming from downstairs, although this in itself is disturbing and did cause me an ears-awake sleepless night after viewing this film. Perhaps one of our greatest fears is as simple as the concern about the creaks and unexplained movements we perceive going on around us during the night. Peli works wonders with only a small set of tools. Most of the results are economically chilling. The noises downstairs. The bedroom door, seen to move on its own when Micah surveys a night’s footage. Katie’s sleepwalking, where she is revealed to stand in the same position for hours at a time. The experiment with talcum powder sprinkled on the landing, exposing far from human footprints. And so on. Like the psychic, the audience begin to sense the awful oppressive air in the house. Unlike him, they probably won’t want to leave it, bearing things out to their horrible end. I came to Paranormal Activity fresh, not having read any reviews and knowing nothing of the plot. This is the way to approach it and I won’t give anything more away. Suffice to say that I was scared. A rarity. An unusual film indeed.